The Central Regional High School Girls’ Varsity Volleyball team finished the 2018 season with an impressive 13-11 record. This was the first time the girl’s volleyball team achieved a winning record since 2013. After experiencing losing seasons for the last five years, the girls were able to see victory through a lot of hard work, effort, and dedication, both mentally and physically. 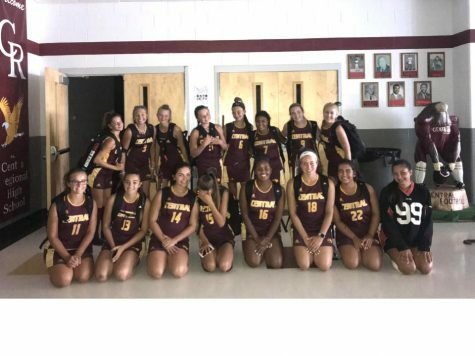 Led by head coach Mr. Mangold, the girls on the court this year consisted of a group who really put their hearts and souls into this volleyball season. The girls worked hard, attending three hour practices everyday after school, working on drills and scrimmaging amongst each other in order to master their individual positions. Within these few hours, the girls worked up a sweat, some even enduring injuries, but all while having fun together. The players say there was constant laughter and good times had by all. The 2018 season truly was a game changer, with many records broken and matches won. The record for career assists was broken by (senior) Ellianna Nardini with 562 assists, beating the previously held record of 484 held by Shannan Edler in 2016. Senior captain Kayleigh McDonough broke the record for career digs with 343 digs. Additionally, the girls’ season record of 13 wins meant that the team finished with the highest number of wins in any given season for a girl’s volleyball team in Central Regional High School’s history. While these achievements were enough for the girls to be proud of, they also made it to both the Shore Conference and the NJ State Volleyball Championship. Unfortunately, the girls did not move on in these matches, but the exposure of playing at that level is bound to pay off in next year’s season. Coach Mangold explains how hard the girls worked to get to where they ended the season when he mentions, “The group of girls I coached this season really worked to their full potential and maybe even harder, and pushing it to the point where they (Mikayla Vaeth) are literally throwing themselves into the stands to get the volleyball over the net.” Mangold is referring to Mikayla Vaeth, who gave everyone doubts and shocked looks this season when they wondered if she was okay, at times when she would throw herself into any object that was in her way to get the ball over. And with her ability, sometimes miraculous, the ball would find its way over the net from anywhere on the court. This not only defended her team, but drew loud cheers from the crowd. All in all, the Central Regional High School Girls’ Varsity Volleyball team’s 2018 season was one for the record books, as well as an amazing experience for the girls on and off the court as they said so themselves. The lady Eagles flew to the top with an impressive winning season and appearances at the Shore Conference and State Championships. More importantly, they knew that win or lose, they had each other’s backs. Saying goodbye to a season filled with so many victories and positive memories will be tough, especially for graduating seniors, but all good things must come to an end. Senior Maciah Bradford sums up the season perfectly as she exclaims, “It was a great experience to have played next to those girls and to be a part of a team that is much more than just playing volleyball. I wouldn’t have given it up for the world”!